Never will understand how you can left your pet at this age in a kill shelter because "you are moving". For me is another lame excuse, so many keep saying it, more because this is a dog who's life never was with any other people like the family who had him for all those years! !..looks also was not well taking care, needs some grooming!!.. Why people get pets they cannot commit for life, and they can't even afford grooming which is essential for this breed!..She is in deeply need of FOSTER/RESCUE OR GOOD ADOPTER FAMILY!..little dogs can live longer!..please someone step up!..her time is up, and shelter wants to help her. 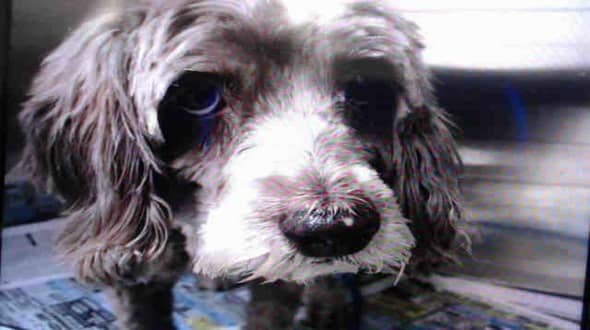 MOKA (A1952999) I am a female gray and white Poodle - Miniature mix. I was turned in by my owner and I may be available for adoption on 05/05/2018. Fidonation, if you or someone you know is interested in giving this pup the forever family he rightfully deserves, please contact the Miami-Dade Animal Services at +1 305-468-5900, and reference the shelter ID #A1952999. 1 Response to "12 years old Surrendered to Miami shelter, the last call has been issued for a terrified moka"
I could cheerfully kick the living snot out of these creatures. They don't deserve anything but scorn, hatred and ridicule. I hope karma comes around, and You get shoved in a warehouse style nursing home, abandoned and ignored, so YOU can die exactly like you condemn loving animals to do. Disgusting, sickening, if you see yourself in this description, Yes, I'm talking about YOU. I hope you die an ugly, painful death.